Scheduling outdoor concrete production such as pouring bridge decking or pre-cast forms is difficult, especially in northern climates, as weather conditions are unpredictable. We have developed products that mitigate weather conditions and allow bridge construction activity to proceed on schedule 12 months a year. To protect pre-cast forms, an elevated, track mounted, self-propelled canopy system covering each precast station provides protection from rain or snow during the pouring and finishing processes. The electrically powered traction drive systems move the canopies away from the forms when the crane is ready to lift the completed segments out of the work station. This supports a just in time fabrication schedule and avoids the expense of schedule delays. To protect bridge decking, a steel framed fabric covered structure is mounted along the outside of the bridge structure. 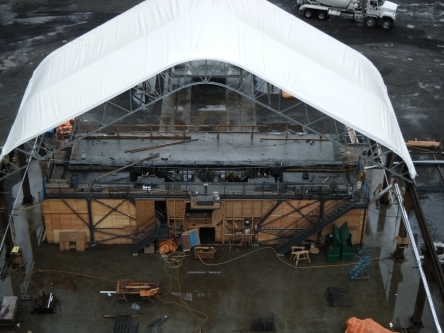 Fully enclosed at each end and equipped with doors for personnel and equipment egress, the shelter is heated to create the environment needed to finish and cure the concrete deck. This enables construction scheduling without seasonal delays. In addition this supports year round bridge construction resulting in more economical utilization of both equipment and labor. Pre-stress concrete fabric structures should become an integral part of any bridge construction planning. We have completed projects like this on the Belt Parkway Bridge for Tully Construction and in Vancouver, BC.